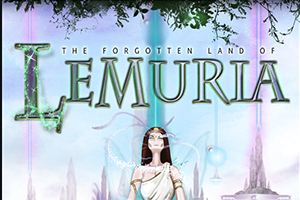 Become an explorer with Microgaming’s The Forgotten Land Of Lemuria slot based on the tales of the lost continent of Lemuria. Although said to be a sunken island off the coast of the Pacific, in recent years the theory has been dispelled as a myth. Never fear, though, The Land of Lemuria slot game is on hand to give you a very real chance to plunder the treasures of the island. Comprising of 5 reels, 3 rows and 243 permanently enabled pay ways the chances to win are no mere folktale. When we think of lost islands such as Lemuria or indeed the more well-known Atlantis, we think of paradise. This is the theme which has been picked up by the designers of the slot. The background depicts a scenic, waterfall enveloping an ornate palace. The symbols you want to aim for are the more mystic ones which tie in closely with the theme. The engraved tablet will net you the highest return while the crystals, skull and waterlily will grant you a substantial win. The interface on the slot is easy to use as is common with other Microgaming slot games. All you need to do is select your coin size, the number of coins you wish to bet and you’re good to go. If you need any more information about the exact value of Lemuria’s coveted treasures, then head to the ‘View Pays’ section where you can access a wealth of game stats on the Forgotten Land Of Lemuria online slot game. If you’re a pro and want to run more than one spin at a time, then the autoplay function is available to grant your wish. Run games of 5 or 10 by clicking the expert tab. In The Forgotten Land Of Lemuria slot game, the wild symbol is the game logo. The wild symbol can be used to complete a winning combo in any pay line, by substituting for all other symbols except the scatter. While you’re watching out for the scatter symbol, it may be looking right back! The scatter symbol in The Forgotten Land Of Lemuria online slot game is The Eye. This symbol will complete a winner scatter combo when it appears 3 times on any pay line. However, to unlock the Treasure Vault Bonus game, 3 scatter symbols must appear across all 5 reels. Fulfil the dream of pirates everywhere and bring home the treasure in this epic Treasure Vault Bonus Game included in The Forgotten Land Of Lemuria slot. The main vault is comprised of 3 elementally themed mini vaults; Water, Earth and Fire. Inside each of these three vaults is 10 objects. Which hidden gems are hidden behind these objects? Well, there are three options. Inside each vault, you will be able to pick objects where you will be met with either a bonus, a NEXT VAULT symbol or an END FEATURE symbol. You will keep all the bonuses you find until you find either a NEXT VAULT or an END FEATURE. The former will progress you to the next vault while the latter ends the game. When you finish, you will collect any bonuses you unlocked. The longer you stay in the game, the larger the bonus! Want more mystery slot games like this one? Try The Bermuda Mysteries slot as you will not be disappointed.